"We purchased a new construction home with a small back-yard that we wanted to exploit to maximize our out-door living space whilst avoiding having to look into a neighbours yard from a raised deck. We decided the best approach was a large stone patio that incorporated a stone staircase and planting beds into an overall landscape plan that gave us solid and low maintenance alternative to wooden decks. We also wanted the job done correctly from the beginning and not have to worry about a major 're-do' after a few 'hard Ottawa winters' - in short, we wanted a quality long term job, at a reasonable price, from a reputed contractor. After significant research, we were taken by the testimonials and the time-lapse photo sequence on Chris' website, as it shows exactly how they are going to do the job - no shortcuts. For us, this was the deciding factor and we asked Chris for a job quote. Again, understanding that he and his team are busy (which is a good sign) we arranged a meeting to scope out the work and he then went away to calculate a detailed estimate for the job. This was important for us, as we did not want an 'off-the-cuff' quote that would change as the job progressed. We received a detailed quote that covered the job in it's entirety and while he and his team remained flexible in minor details during construction, there were no changes in price. We scheduled a time for work to commence and his team arrived on-time and fully prepared. We were extremely pleased with the professional nature of his team as they are enthusiastic, absolutely meticulous in job-site cleanliness (they completely clean-up at the end of everyday) and are totally self contained. The standard of work is very high and significantly better than other contractors we saw in the local area doing the same job. Yes, Chris and his team may be a bit more expensive than other contractors, but you can really see the difference. Specifically, the site preparation prior to laying stone is extensive and thorough. Not only did his team dig down deep, the grading and drainage work, prior to one stone being laid, was impressive - of note, he uses quality products (with a large selection). Our neighbours have all commented on how good it looks and we know we have a long term, no maintenance, outdoor living and entertaining space. We remain extremely pleased with our back patio and have asked him to come back in the Spring to do the front entrance and footpath. We have, and continue to, strongly recommend him and his team, as the quality of their work speaks volumes. They are committed to a first class project, on-time and on-budget." “In 2010 we decided to have some landscaping and interlock work done at our home in Ottawa. After several weeks of intensive research I narrowed down the list to 12 companies. I interviewed each contractor and requested estimates for the work to be done. Chris provided a quote which was very competitive and was prompt with his reply and follow up. Unlike several others who had to be reminded repeatedly about their quote or whose estimates were unbelievably too inexpensive. Chris and his crew were prompt to the site, completed the work on time, cleaned up every day, and were very flexible and accommodating when we requested a few changes. Chris also came up with some innovative suggestions and improvements to our original plan. "I am a handyperson so I decided to design and build my own patio and walkway two years ago. I soon realized that this was a job best left to professionals with the right skills, tools and equipment. Hiring Chris and his crew to build our patio and front walkway last spring (2010) allowed us to spend the summer enjoying our patio instead of struggling to build it. I am also a perfectionist and very particular about how work is done around my home. The work done by Chris and his team surpassed my expectations. I recommend Chris to you because he is courteous, because he takes pride in his work, and because he does the work right the first time." "Chris and his crew do great work. Two years ago I decided to change my walkway, install a step and reface the porch that was a concrete slab. The guys worked so hard that even the neighbours commented on their work ethic. Now I have a beautiful walkway and porch that compliments my garden and adds wonderful curb appeal to my house. I would highly recommend Custom Interlocking & Landscape Design Ottawa. They have competitive pricing and I would definitely use them for future projects." “Shane and I would love to send some pictures. Our experience with you and your crew is one we will always remember. Especially every time we eat outside, sit with company outside play outside, or relax in our hot tub. We had no idea how much we would enjoy the results of our backyard project. Your crew was very professional but better yet personable. We shared many a laughs over rocks and even enjoyed a burger and a cold drink. You were great on helping us make a big decision seem easy with the reward of a beautiful finished product. We enjoyed having you, and would always recommend you to friends. We would also have you back instantly for future projects. You understood how important this project was to us and were supportive in our changes, suggestions and even our worries. Many people have asked to see your work and have mentioned how wonderful it looks. We were even told by some that they have "backyard envy". Thanks for making our backyard dream a reality." "When we purchased our house we knew that the footpath and drive would require an overhaul. Having done a considerable amount of research we obtained several quotes from a variety of Companies within the Ottawa area. When deciding to get a job done price is not always the deciding factor as quality has to be there in order to make something worthwhile. With the quotes we obtained it seemed that we could achieve one, but not the other. When Chris gave us an estimate and showed us pictures of previous jobs he had completed we felt that we had achieved our aim and were confident in him and his team undertaking the work. We were not disappointed. The work was completed on time, on budget and to a very very high standard. He guarantees his work and does actually follow up to ensure you are happy with everything. My neighbors were so impressed he obtained several other jobs from them. We remain very happy with our drive and footpath and have just asked him to return in order to price another job for us. Would we recommend him and his team - definitely. Outstanding and committed to providing a first class service he is justifiably proud of his work." "We had Custom Interlocking do our driveway at our home in Westboro in spring 2009. The graded solution has solved the storm drainage problems we had. The result is beautiful, and we receive compliments on it regularly. Chris and his team are hard working, and very honest. He was upfront about challenges that he might have, and never did anything that might cost more without laying out all the options first." "Chris did our front steps three years ago and we still can't find a single loose block. He was so courteous and professional we recommended him to all our friends." 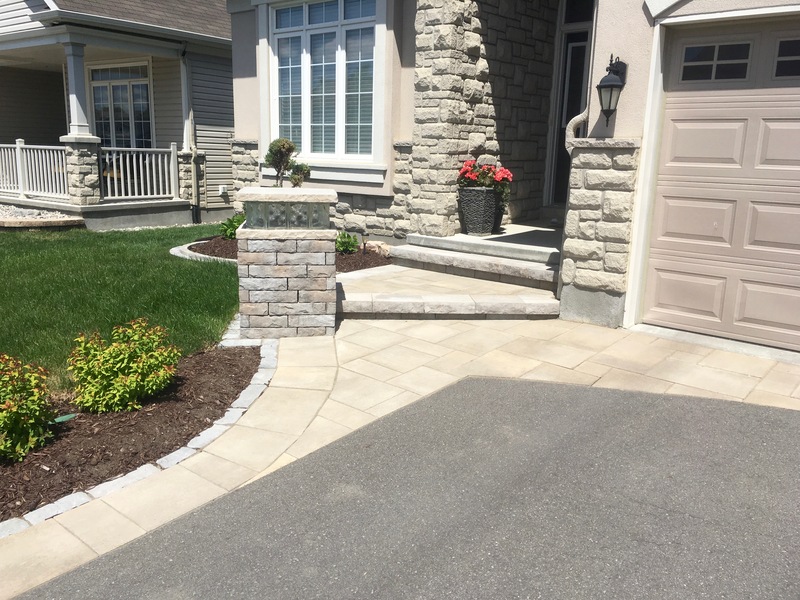 “Custom Interlocking has done a lot of work for us in Ottawa and we love everything they have done! After having Custom Interlocking build an extension on our existing retaining wall we realized their work is much higher quality than our previous contractor. Since then, Custom Interlocking has laid a portage interlocking walkway in our backyard, a garden wall and another interlocking walkway in our front yard. This contractor was very professional and meticulous with his work and it shows in the results! We are so happy we chose this company for all of our work that we're thinking about more! "Chris did a great job of my stone patio, I would hire him again"
Chris and his team are awesome to work with! Chris was so professional and patient throughout the design process which I really appreciated as I had a lot of questions. Once the work started it was completed within 3 days. I couldn't believe how fast these guys were! They extended our driveway width on both sides with interlock and built a walkway with steps leading up to our house. They also built a beautiful large planter and filled it level with soil. I highly recommend Custom Interlocking for your landscape project! Chris and his team did a few projects for us in the past few years. We were very happy with Chris's design ideas for our backyard and front yard and the quality of the work. Chris is a pleasure to deal with, he is dependable and easy to reach. We even trusted him and his team to complete the job while we were away on our vacation and they delivered as promised to our satisfaction. Highly recommend Custom Interlocking. We have been dealing with Chris Libbos from Custom Interlocking and Landscape Design over the past 10 years. He initially installed a complete interlock backyard in our condo and it has stood up beautifully. Most recently he did some lift and lay in our rear yard and front step of our primary residence and we are more that satisfied with his work. His staff were polite,reliablle and knowledgeable. If you want professional, quality work at very reasonable prices, I would recommend this company. Before my wife and I decided which landscaping company to use to change our walkway, we spoke to neighbors who had work completed by Custom Interlocking Design. The feedback was excellent. Comments like, " the crew were professional, and courteous, while demonstrating a high level of quality work from start to finish." I personally made multiple visits to houses where Chris ( the owner ), and his crew had completed work. I couldn't have been more impressed with what I saw. As a result of seeing the quality of work performed by Custom Interlocking Design, I booked Chris' company immediately to change the look of our front walkway. I wouldn't hesitate to use this company again for future projects. I am very happy with the interlock patio from Custom Interlocking. It was built 3 years ago and still looks great. Chris truly cares about his customers and his workmanship. He has worked through any obstacles to my complete satisfaction. I would recommend Custom Interlocking to others. I have another project coming up and have contacted Custom Interlocking again. We have hired Chris and his crew on three different occasions for three different jobs. Chris is an ultimate professional - easy to deal with, no nonsense practical guy. He is an active listener who insures that all your ideas are captured and transformed into the completed product. . He was on site for all three jobs - working alongside his guys. You can trust him to exceed your expectations - outstanding work man-ship that is only exceeded by his personality. We'll gladly hire him again. Chris had great ideas and worked with us so we got exactly what we wanted for driveway and front walkways. Finished project exceeded our expectations.